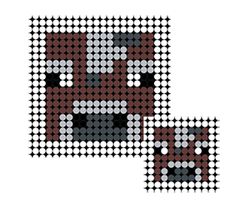 Free, printable, Minecraft animal face patterns for fusible 5mm plastic beads. My daughter wanted a Minecraft shirt her her birthday. She didn't tell us which one. Of all the shirts I saw the one I liked best was one with Minecraft animals all stacked up. Apparently I chose well because she later told me the animals are her favorite. Anyway... that shirt inspired this page (it's also ON the page near the bottom). If you like them too here's a craft idea for you. I've made Perler Bead patterns for four animals in two different sizes each. You'll be able to make a medium or small Chicken, Cow, Pig, and/or Sheep. Colors and counts are also shown. If they fall they will land gracefully. You can use the eggs to make cake. If you kill one you get a chicken breast and 0-2 feathers. You can use the feathers to make arrows. You can cook the chicken breast in a furnace. You can eat the raw or cooked chicken. Download the full size document for printing. PDF includes Chicken and Cow templates. If they fall from a high place they will die. They can be milked by using a bucket. You can use the milk to make cake. If you kill one you get 1-3 slabs of beef and 0-2 pieces of leather. You can make armor with the leather. You can cook the beef in a furnace. You can eat the raw or cooked beef. 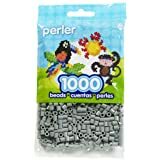 You'll need these grey beads to make the chicken, cow, or sheep. You'll need 120 brown beads to make the cow. You'll need 184 peach beads to make the pig. If you kill one you get 1-3 pieces of pork. You can cook the pork in a furnace. You can eat the raw or cooked pork. PDF includes Pig and Sheep templates. They can be found in various colors: white, black, grey, brown, and pink. You can sheer a sheep to get 1-3 blocks of wool. The wool will grow back. If you kill a sheep you get 1 block of wool only that one time so don't kill them. The color of the sheep determines the color of the wool. You can make beds and carpet from the wool. This is the set that I have. You can use a single piece or join them together in a larger square or rectangle. I like the clear boards best so you can place a pattern right underneath them. Download the full size document for printing. PDF includes all 4 tiny templates. 1 sheet includes 4 stickers. Which Animal on Minecraft is Your Favorite? Printable masks and paper mask crafts for children.